Hi, This is an Android PC Suite guide for all Android and Micromax Smartphones. By this guide you can easily install Android PC Suite on your Computer and make connection between your Smartphone and PC or Laptop. This is a very useful guide for Android phone users, who want to take a Backup and Sync of their contact, SMS, phone Book, App etc on PC. 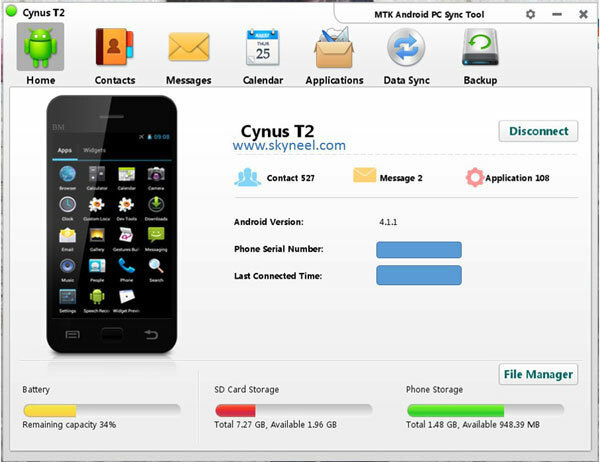 Android PC Suite is a very useful tool for manage your Android Smartphone like Micromax, Samsung, HTC, Nokia etc. Android PC Suite provide ultimate features for Android phone like you can manage your contacts on PC and save your SMS, MMS and other media on your PC. You can take backup of your app by this tool. Have a look how to install PC suite. Step 1: Enable USB Debugging on your Phone. 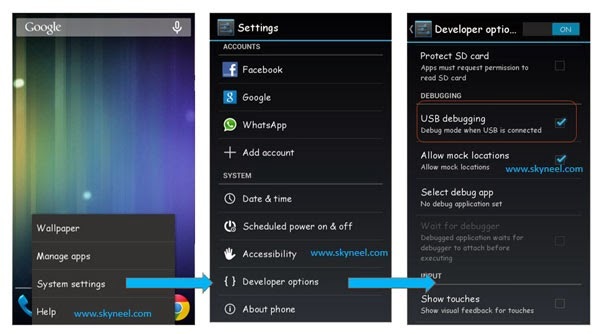 Go to Settings >>> Developer options >>> USB debugging check it ( If your phone have Android 4.2 or upper version then see how to enable Developer options here is guide of this Click here). After then switch off your phone. Step 2: Now connect your phone to PC. You will get Driver Missing Error then follow these steps to install driver on your PC. Right Click on My Computer >>> Click Manage >>> Device Manager >>> Right Click on Micromax A110 or your phone model number (Missing yellow icon in the list) >>> Click on update Driver >>> Click on browse My Computer >>> Click on Browse >>> choose MTK Android PC Sync Tool V2.1233.1 folder >>> Install Driver. If you feel any problem in install driver then watch this video Click here. 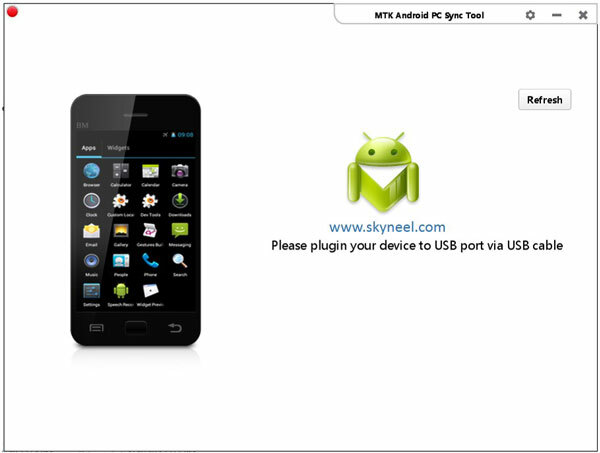 Step 3: Download Android PC Suite click here and extract PC-Sync-SW-for-Micromax-A110.rar file. 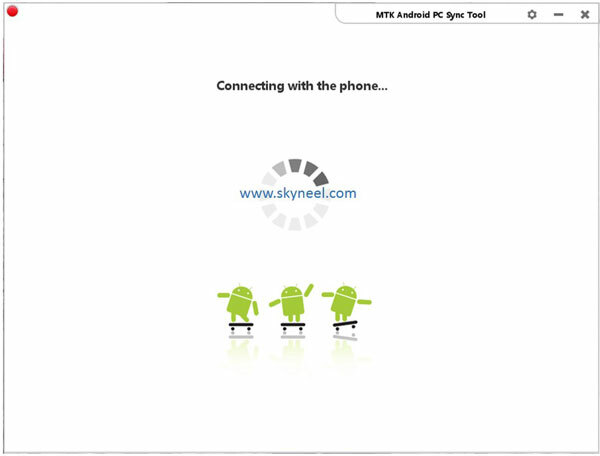 Step 5: Connect your Phone / Android Device to PC. Now PC suite automatically detect your phone. 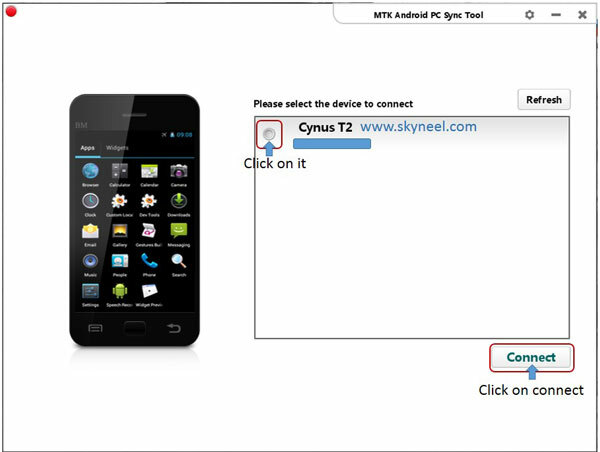 Step 6: I am use Cynus T2 Rom on My Canvas 2, so it is show Cynus T2. select your phone then click on Connect. Step 7: It is take few second to connect your phone. Step 8: Now you will take back of your Contacts, Massage and apps. I hope you like this Android PC Suite guide from which you will be able to easily connect your phone with PC and take your phone backup on your PC. If you like this article or have any problem in this guide then please give your important suggestions in the comment box. Thanks to all. It can back up data from Android phones to iPhones? The latest feature added: Transfer contacts from Android phones to iPhones, and Transfer contacts from iPhones to Android phones. Go to setting then scroll down then you will find about phone option tap on it then you will find your phone os version like Android 4.2 etc. and build number and custom build version show your phone OS update information. 1. Ram is right, it is 1 GB and phone storage is 4 GB. 3. Tap on menu button then system setting after then tap on account which you want to synchronize, check the sync box. just enable USB debugging mode then install vcom driver on your PC then follow these steps. I flashed CWM successful! Then I did a factory reset from settings/privacy and then I couldnt boot into recovery! So I flashed Stock Recovery again using Mobile uncle tools, It didn't work so I flashed it with SP Tools! When I enter recovery mode it restarts normally. No matter what I do I cannot get into recovery mode! furthermore i get invalid imei number when i open my phone. i am stuck and i have tried everything i could get my hands on. plz help !!!! hi , m new here. i own a micromax A114 and after installing cmw recovery and restoring my backup, i couldnt get any imei number, it said IMEI invalid, so i did a full factory reset and since then i lost my abilty to go to recovery, to go into engg mode, and also the previous problem of no IMEI number, what to do , plz help asap. Hi i have micromax canvas a114. From past few days i am facing some problems in my mobile. 1. During phone call when i try to disconnect the phone on thst time display does mot appear. Battery always show 99% . when i disconnect it from charger then plug again it shows 100%. Could you please tell me is this hardware prblem or software pproblem. If it is software problem then please provide me the link of latest rom for a114. Thanks a lot for such a wonderful post that resolved my issue. God bless u.
I m unable to install cwm mode so plz help me how to install cwm mode and how to made my canvas 2 as a root.. I already have a backup file with .backup extension. How to restore it? If I try to restore it via phone it gets struck and I have to do a factory reset. How to delete system applications & increase my RAM usages in Micromax A72 Canvas Viva? and what's steps you use ? same problem….stuck at 98%….for almost 10 minutes! It was going pretty fast in the start! What to do! I need help now! plz! Sry fr freaking out….was in real hurry! Im not able to root my phone with procedure axplained in xda dev ,no ring is visible after removing battery and flashingeven second method to root also does not work of bat file ,plz help! thanks. I was able to use it. thanks a lot. My device is not showing on device manager when connected in turned off state… I connected it once and that time it showed drivers missing… So i installed mt65 usb vcom drivers… Device is not showing on device manager since then..